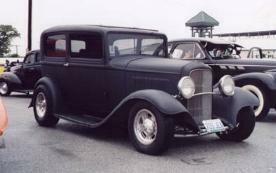 Of all the old 30's style HotRods, my favorite would have to be the 32 Ford Model A. The 30-31 were similar, but not exactly. 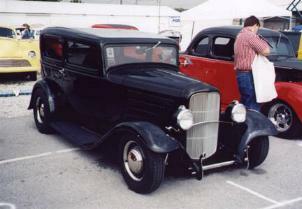 The 32 Chevys were similar as well, but not exactly. I have a few requirements for the car that I want, and most of the modifications, I'd be willing to try myself. First off, it would have to be a 2 door sedan. 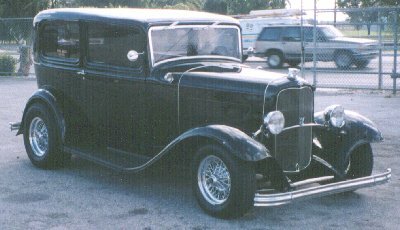 There are models called the 3 window and 5 window coupe, which do not have the cabin extending all the way to the rear. The sedan always has 5 windows (unless its a 4 door) and they (and the cabin) extend to the rear. It has to be chopped (meaning making the windows shorter by removing 5 inches or so) - not an easy task. I'd want the fenders left on (many people opt to take them off for a "hi-boy" look), and the door handles taken off. It would have to have a Chevy V8, some modern rims, fat tires, and a nice interior. The paint would likely be yellow.